This fab tailored 1960s Mod 3 button Mohair blend suit jacket comes in a fantastic Retro textured blue tonic like fabric. An awesome contemporary slim cut and refreshing colour designed to stand out whilst maintaining a suave and sophisticated Mod edge. All the iconic Mod traits in tact, including right side ticket pocket, Retro slim notch lapel and traditional side vents. 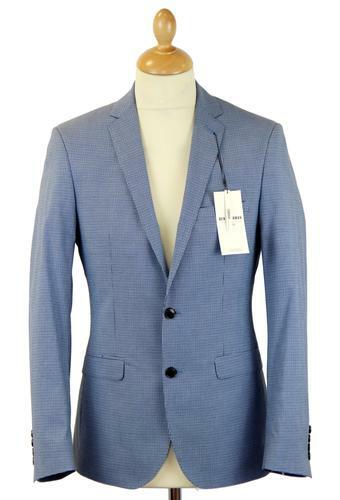 This stylish blue blazer jacket is a surefire Mod Clothing masterpiece. 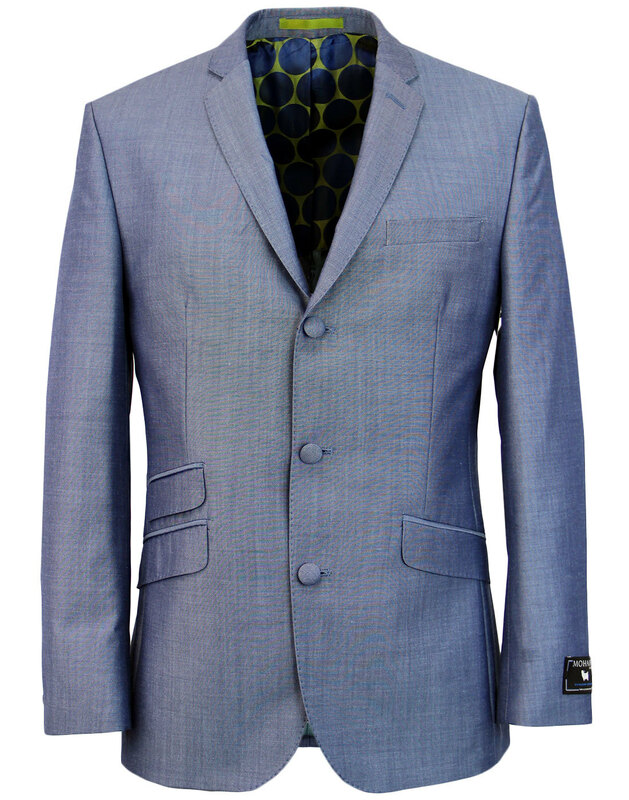 This tailored Suit Blazer offers a stand out two tone tonic look for a real Mod Revival flair. 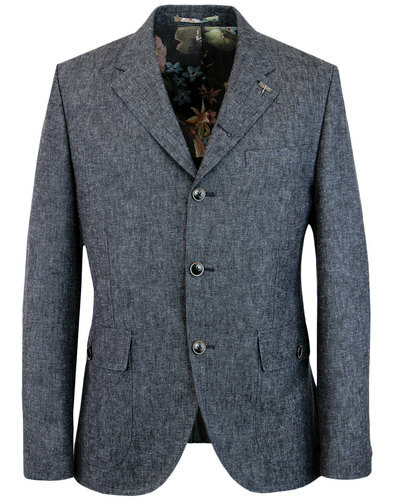 Expertly crafted from Mohair blend fabric, this suit jacket is a must for any Mods. Pair with matching slim Retro trousers for a cool two piece suiting option. - 60s mod blue tonic mohair suit jacket. - Right side Mod ticket pocket. BR>- Side vents. - Retro twists include part oversize polka dot lining paired with and block colour shimmering turquoise. - Lime piping trim to inner which also accentuates the internal pocket details. - Left breast pocket that could be accentuated by Retro pocket square if desired. 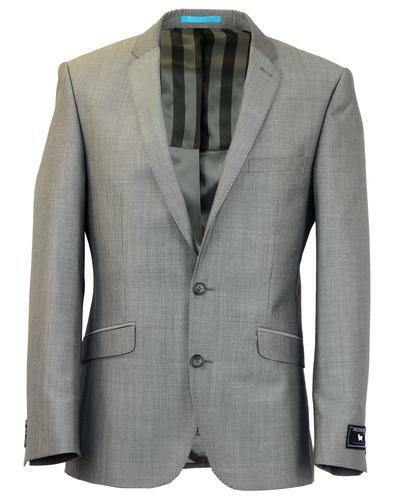 - Slim notch lapel with button hole detail to the left side. - 3 covered buttons to the non-working cuffs. 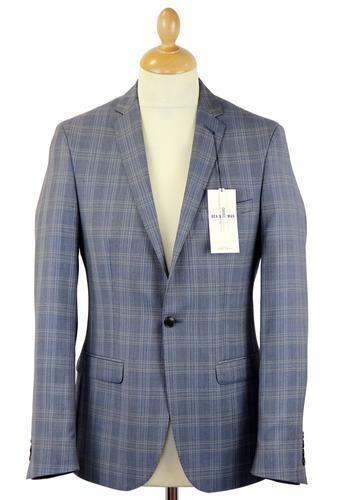 - SKU: S17106SB3 150 Mohair Suit Jacket. Please choose chest size to fit. Size up for a roomier fit.